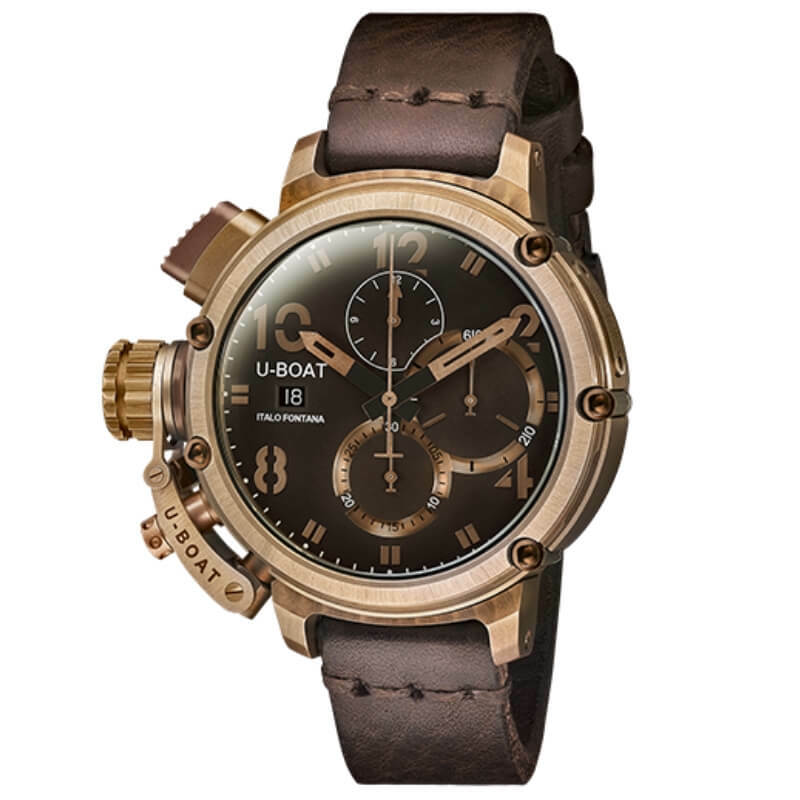 Top Soigné with black screws, rhodium plated, automatic mechanical chronograph personalized to U-Boat specifications for date display and stem to be positioned at 9 o’clock. Frequency: 28.800 vibrations per hour, 4 Hz. Power reserve: 44 hours. 25 jewels. Height: 7 mm. Hours, minutes, chronograph, counter small seconds at 3, counter 12 at 12, counter 30 minutes at 6. Date window at 9 o’clock. Naturally bronze aged, 46 mm diameter and 54 mm diameter including external crown-clutter. The bezel and the back of the case are locked together by external tubing and a customised key that ensures absolute water resistance. Oversized cupcrown for an easy manipulation, secured on the carrure, positioned at 9 o’clock. Winding crown in steel, heat-treated. Chrono pushers screwed in on the carrure(pusher at 10 with milling finishing). Personalized rotor, in silver, 3 bridges construction, rhodium plated and fixed with blued screws. Two superimposed dials, one treated with composite pigments and laser cut on the counters and hours, the other in matt bronze colour, azuré finishing on the small seconds and minutes counter, cut and printed. Hour and minute laser cut hands, hand brushed on the surface, hand painted central joint. Hands of the counters in bronze color, hand brushed. Bronzed glass, sapphire curved on the front and flat crystal on the back of the timepiece, double gasket sealing. Hand made and hand finished calf leather, carefully selected and processed following the traditional artisan handcrafted techniques used in the 1800’s, which give the strap a naturally distressed feel and look. Tongue buckle in bronze, naturally aged. Innovative steel crown release system (patented) at 8 o’clock for easy time and date setting.